Low fat powder made from partially defatted organic chia seeds. 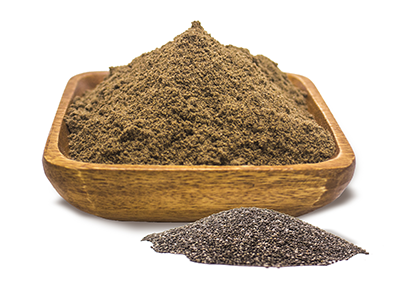 Chia seeds are cold pressed and the partially defatted cake is grinded into a fine powder. As a baking ingredient: Substitute wheat flour 1 for 1. In sports nutrition shakes, can build viscosity, replacing hydrocolloids like Arabic gum, offering your product a ‘cleaner label’.